Strawberry Spinach Salad is a great pick-me-up dish. Plus, it doesn’t hurt that there are a ton of benefits from eating spinach. First, it is chock-full of iron. Second, it is a great source of some key vitamins: vitamin K, vitamin A, vitamin C, and Folate. Did you know, it’s good to eat at least a cup of spinach every day? It is also low calorie, so our Keto friends can dig in too! How should I store this salad? If you don’t plan on eating this salad all at once, we suggest you don’t mix it all together right away. If this is the case, simply prepare all the toppings, spinach, and dressing in their own containers, and prepare portions as needed. But, if you plan on taking this to a party and coming home without leftovers, feel free to mix everything together in a serving bowl. Your guests will love this one! Fast, easy, and refreshing salad topped with crunchy slivered almonds and irresitable avocado dices. 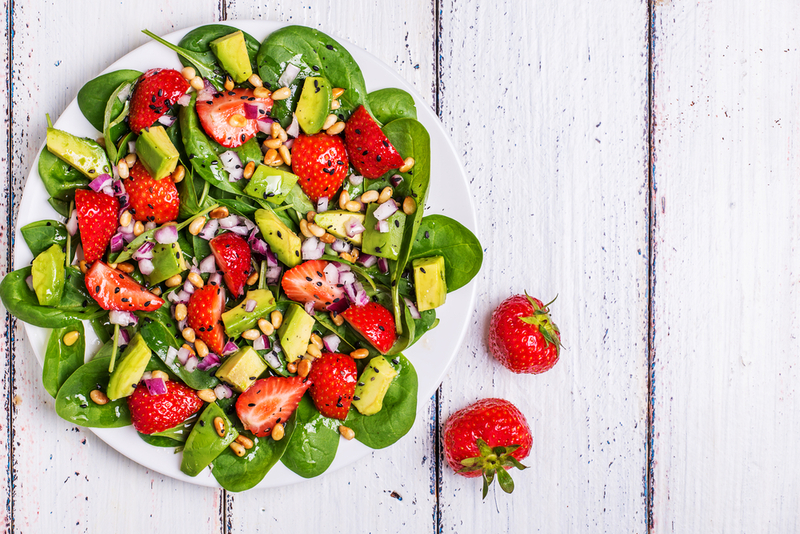 You won’t be able to get enough of this Strawberry Spinach Salad! First, divide the spinach, strawberries and avocados between two salad plates. Then, in a small bowl, whisk the oil, sugar, vinegar, sesame seeds and poppy seeds. Drizzle over salads. Sprinkle with almonds; serve immediately.